As the debate on relief measures for distressed farmers continues, India Ratings has said income support as a core centrally sponsored scheme is a better option than debt waiver. It says in case the FY20 interim Budget announces an income support of Rs 8,000 per acre per annum for marginal and small farmers, a marginal farmer and a small farmer would receive Rs 7,515 and Rs 27,942 per annum on average, respectively. The levels are significantly lower than the amount conceptualised under the universal basic income scheme for the poor proposed in the Economic Survey 2016-17. The support would cost the Centre exchequer Rs 1.47 trillion. However, if it is rolled out as a core centrally sponsored scheme, the cost would be split between the central and state gover­n­ments. 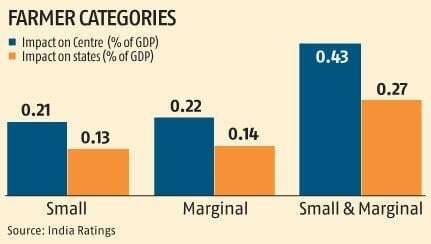 The cost to the Centre exchequer would be 0.43% of GDP, while the cost to the combined state exchequers would be 0.27% of GDP.